One of California’s greatest energy challenges is finding innovative ways to lower natural gas consumption to help reduce greenhouse gas emissions that contribute to climate change. To help meet that challenge, a new solar energy system that produces both heat and electricity might not be far away, thanks to researchers at UC Merced and the California Energy Commission. Professor Roland Winston, director of the University of California Advanced Solar Technologies Institute (UC Solar), and co-Director Professor Gerardo Diaz received a nearly $1 million grant from the commission to develop a high-efficiency combined heat and power (CHP) system that produces electricity, hot water and space heating for homes and commercial buildings. “The idea behind our project is that you can produce your own electricity and heat your water or the inside of your home or office with a system that takes up the same space as a single-use photovoltaic (PV) installation,” Winston said. Traditional PV systems face an obstacle. They get extremely hot, and efficiency drops as the temperature goes up, Winston said. UC Solar’s design will harvest that heat to warm water and buildings. 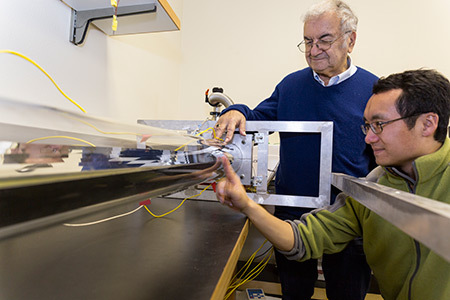 The system uses nonimaging optics to concentrate solar energy, aluminum minichannels for thermal collection and commercially-available solar cells for electricity production — all packaged in an inexpensive glass tube. The unique solar cell/minichannel interface allows the collection of thermal energy, while simultaneously cooling the solar cells and enhancing their efficiency, UC Solar Executive Director Ron Durbin said. The aluminum minichannels were developed by Diaz’s lab for other thermal projects including one currently being tested near Aliso Canyon in Southern California, the site of a large methane leak last year. “We are combining technologies that have been developed at our research labs to produce a novel product that can make an impact in energy efficiency and natural gas consumption,” Diaz said. By pairing that technology with low-cost optics and other materials and making it as easy to install as a single-use PV system, the researchers said their CHP system will be affordable for many. And with the San Joaquin Valley’s abundant sunlight and the ability to create solar arrays and tune the solar cells for optimum performance in all 16 of California’s building climate zones, they predict it will have applicability throughout the state.